Usain Bolt has been declared the "fastest man in the world." While this hasn't always been technically true, he has won so consistently at the 100 meter distance throughout his career that the nickname "lightning bolt" seems like a pretty good fit. He has won 6 Olympic gold medals, never placing for silver or bronze. In other world championships, he has collected 8 first place wins and 2 second place finishes. During his time competing in youth championships, he regularly took first place, rarely second, and never third. For the tiny island nation of Jamaica, Usain Bolt is a hero. He's confident. "I told you all I was going to be No. 1, and I did just that." While he's a supremely confident competitor, he's also humble and cordial. "Manners is the key thing," said Bolt. "Say, for instance, when you're growing up, you're walking down the street, you've got to tell everybody good morning. Everybody. You can't pass one person." But his success on the track and his international stardom has not come without challenges. As a young man, Bolt suffered from scoliosis. "When I was younger, the scoliosis wasn't really a problem. But you grow and it gets worse. My spine was really curved bad. The early part of my career, when we didn't really know much about it, it really hampered me because I got injured every year." Instead of using a brace or enduring dangerous surgery to correct the abnormal curvature of his spine, Usain Bolt used chiropractic treatments. "I've worked hard over the years. I've been injured and I've worked hard through it, and I've made it." Bolt uses chiropractic not only to bounce back more quickly from injuries, but also to enhance his performance while healthy. "As long as I'm in great shape, nobody beats me, for sure." Dr. Michael Douglas has worked with Bolt for many years. As founder of three South Florida Douglas Rapid Rehab Centers, he is also the Jamaican Olympic Team's official chiropractor. He has held that position since 1996 and retains a certificate in Chiropractic Neurology. He combines traditional chiropractic techniques with sports injury rehabilitation to keep the Jamaican team in top condition. Like all world champions, Usain Bolt realizes that his work is never done. "For me, I'm focused on what I want to do. I know what I need to do to be a champion, so I'm working on it." 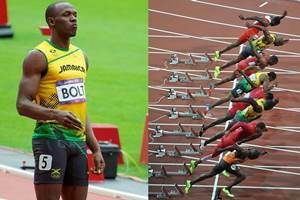 For Usain Bolt, chiropractic care has been, and continues to be, an essential part of his overall strategy for remaining healthy and competing successfully. Do you want to be able to perform your best? Give us a call at (303) 776-6767 to find out how chiropractic care can help you!